Second ship from Venezuela arrives with aid for victims of Hurricane Matthew | Cuba Headlines en Español – Noticias de Cuba, Noticias de Última Hora en Cuba y el Mundo. 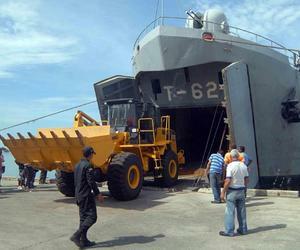 A second ship of the Venezuelan Navy was received in the port of Santiago de Cuba by General Ramón Espinosa Martín, deputy minister of the Revolutionary Armed Forces (FAR by its Spanish acronym) and member of the Political Bureau of the Communist Party of Cuba (PCC). He was accompanied by Lazaro Exposito and Beatriz Johnson, president and vice president of the Provincial Defense Council in Santiago de Cuba, and Manuel Quevedo, People's Minister of Habitat and Housing in the Bolivarian Republic of Venezuela, and Major General Juan de Jesus Garcia, Venezuelan Army Commander General. We bring about 400 tons with much love and patriotism for the Cuban brothers said captain Henri Javier Gamar, who reaches the city of Santiago for the first time after five days of sailing with good wind and calm sea. The cargo carries 600 electric transformers and 15 000 square meters of light steel roofs, and 1 125 electro-welded meshes used as reinforcing steel. It also includes four front chargers and four trucks, plus components of the wet mortar plant, unloaded in this port last Thursday by Tango-63 vessel. Manuel Quevedo ratified on behalf of his constitutional President that the people and authorities of Cuba can count on the support of Venezuelans, and communicated Nicolas Maduro´s decision to activate the 251st international corridor of the Vivienda Venezuela Great Mission, as a geographical space to assist in the repair of houses. He added that, similarly, in the coming days it will also be open the 252nd corridor in the Republic of Haiti to jointly support the recovery in that country. Quevedo, Major General Juan Jesus Garcia and Rogelio Polanco, Cuba's ambassador to Venezuela, together with local authorities, flew over municipalities Imías, Maisi and Baracoa, and shared directly with affected people. Speaking to the press, Major General Garcia said that during the tour he met the mission of the Venezuelan government to inspect the Toa River Bridge, which collapsed due to force of the water. From next week, he added, engineers of the Venezuelan army and technical teams, along with FAR, will work together to make the project in the shortest time possible and rebuild the important step for transporting passengers and goods between the municipalities of Baracoa and Moa, in Holguin.